There are a few shrubs of jasmine in the gardens near my flat and for the past weeks, ever since they bloomed, it’s impossible to pass past them without noticing their sweet, delicious fragrance. I love the flowers and getting to see them almost everyday inspired me to try and quill them. I made the variety with 4 petals, bell-shaped flower. I did a little bit of reading and found out that it belongs to the Oleaceae family (same as the olive trees) and that there are around 200 species, all indigenous to the tropical and warm temperate regions of the Old World. Unfortunately, I can’t seem to find anywhere the name of the species I quilled, so I still have to do some research here. Jasmine is the symbolic flower of Damascus which is also known as the City of Jasmine and also the national flower of Hawaii, Indonesia, Pakistan and Phillippines. The jasmine is widely cultivated for its flowers, used either for tea, essential oils, syrup or as decorative plant. For the quilled jasmine flowers I used 1.5mm wide paper strips, hand cut from 160gsm white paper. They turned out pretty big: for the largest one I rolled 6 paper strips, each 30cm long. I shaped the petals with the mini mold from Quilled Creations, a lovely and extremely useful gift that I got from Pritesh to whom I want to thank again. The center of the flower is similar to the one I made for the blue poppy. For the leaves I used 120gms paper. I recently bought a new shade of dark green which I think goes very well next to the white flowers. For each leaf I glued 2 layers of paper, thus making them very thick, but easy to shape. The whole arrangement, including the vase, is approx. 15cm tall. I hope you like my quilled jasmine flowers! I’m already thinking of other branches with blooms to quill for my next project. Any suggestions? I am entering my project to this month challenge on Homyachok blog – A Cluster of Fragrant Flowers. Sathya, thank you for the wonderful comment! I am so glad that you like the flowers! beautiful flowers and stunning, but only one thing i observed was the pollen inside jasmine will be very less. Thank you, Shylaashree! You are right, the natural flowers have fewer stamens. Unfortunately, I faced some difficulties when I tried to glue the petals and making the flower center larger solved the problem. My breath stopped permanently when I saw this. And now I have come back as a ghost to look at this beauty again. The title is yours in the challenge – I know it, everyone knows it! 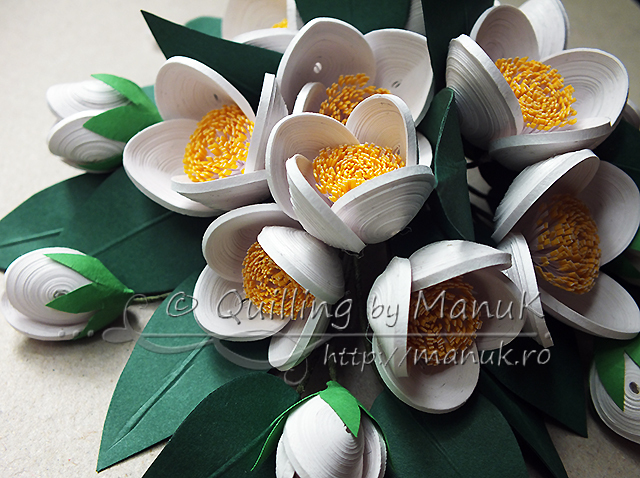 You know, Manuela, I am not into quilling flowers (unless someone orders, like for a present) – I prefer weird stuff. But your flowers really are different from many around and I love looking at them! My husband just saw the jasmine and also said: “Yeah, these really are good”. So thank you for the bunch, accepted (we don’t have stuff like this growing here naturally). Flowers are my favorite things to quill at the moment and I especially enjoy trying to recreate the real ones using paper strips. I am really glad both you and your husband like the jasmines I made! By the way, did you find the quillography tutorial useful? I “googled” forest jasmine, but unfortunately that is not the variety I quilled. If you wanna take a look at the flowers which served as inspiration for this project, check this link: http://www.123rf.com/photo_7511084_white-jasmine-flowers-on-a-background-of-green-leaves.html. That’s an amazing project, everything it looks so real, I can see the hard work you’ve done on that flowers and as well everything is a revelation, a truly art of quilling. Congratulations Manu, this was another post which cames straight to my soul, I love to follow your work. Keep doeing this at the same high standard so far. Wow! This is really beautiful! Love it! Wow, I love jasmine,and you quilled them very beautiful. What I like at you is that whatever you quill, it´s better than others who tried something like that before. Personally I like very much lily of the valley and I would like to see how you do it(in case you don´t find something more interesting to quill. I also like the lily of the valley very much and I will definitely put them on my “to quill” list. Thank you for the great idea! This is absolutely genius project ! how on earth do you manage to cut such thin strips and quill them too ? What can I say about flowers ….Perfect..I am short of words !! Like sathya said hats off to your patience and perseverance !! Thank you very much, Pooja! Working with thin paper strips can be a little bit tricky in the beginning, but trust me, you get used with them very fast. Just try it and let me know how it went! Absolutely gorgeous. Love your designs, as always! Wow, this is much work. Amazing flowers, beautiful. Thank you very much, Molly! You create stunning beauty in your quilling! Thank you very much, Kathleen! This is so stunning Manu.. But I wonder as to how did you do the leaves.. How did the line come in the centre of the leaves.. before sticking two papers did you place a wire or something and then did you stick the another leaf shaped paper upon it? Thank you, Rose! Yes, I placed a wire between the 2 layers of paper before I glued them. Hope it helps! Your branch of jasmine flowers look so real. I can smell the sweet fragrance. It is jasmine season here and it is my favourite flower. Thank you very much, Suganthi! What a coincidence! 🙂 I am so glad you like my quilled version of the flowers! Absolutely gorgeous……I think all of us are falling short of adjectives to appreciate your work!! Of course I am biased, so you can go to the other side of the globe and look up Galapagos Islands native flora. Oh I don’t know, I believe you’ll find something grouse to quill. Zoe, I’m sold on the red bottlebrush and the strange looking lily! I am actually glad that you came back with examples, otherwise it would have taken me ages to decide what to quill! Hehe! I’m off to do my background reading and then time to look at as many pictures as I can find. Thanks for playing along with us at Homyachok’s! Very cool! Love those snowwhite smooth petals, and am absolutely amazed by the fringed centers – can only envy your patience! Superb! Thank you for your feedback, Aljona! The flower center were actually the easiest part of this project. Gluing the petals and shaping the branches proved to be a little more difficult and time consuming. Your work is just stunning Manu, and so “clean”. Thank you very much, Ewa! I always do a little bit of background reading on the subject I’m working on, but only recently decided to share that with my readers. I am really happy you liked my post! Thank you very much, Aurelia! This is gorgeous Manuela, absolutely stunning! so neat! The flowers look so real and are quilled beyond perfect! Thank you very much, Harika! I apologize for the late reply! Thank you very much, Maria! I am sorry, too, for the late reply! I can smell the scent of those Jasmin. The Jasmin around here do not have centers though, they are just white 5 to 7 petaled flowers on green tubular stalks that smell heavenly. I never knew there were Jasmine that are different till I saw yours and referred to the net and they look so lifelike. Another masterpiece from a master quillist!! Chris, thank you so much! There are many varieties, they even come in yellow and pink color. Found out myself while looking at pictures on the net. Thank you for the mail with extra tips for making the curved flower petals, it was very useful! Absolutely pretty and adorable flowers.. Thanks for leaving just a lovely comment on my blog.. Thank you very much and it was my pleasure! Looking forward to see more quilled creations from you! Thank you very much, Daniela! I really love Jasmines. It is also my favorite perfume ever! You have done a wonderful work. I have to say that I’m a fan of your work. Thank you very much, Carla! I am glad you liked my jasmines! Congratulations!!!! You make beautiful flowers, be they normal or weird ones. Thank you, Zoe! I feel like I just passed a test! Haha! waav , all your standing flowers look so perfect and real .. I always have difficulty in attaching the floral wire to the flower..
Ashwini, thank you so much! You’ll get hook in no time, quilling is really addictive! 🙂 Have fun and do come back to share photos with your artworks! I have started quiling recently. Your work is very neat and inspiring. Manu plz give a detailed tutorial on how you attach petals to the centre. I am using silicone gum but cant attach them neatly. Plz help. I still struggle with attaching the petals, but I found that these 2 methods work the best for me so far: you can either glue petal by petal, at an angle, directly to the stem and the stamens (just hold them in place with your fingers until the melted glue dries completely) or you can adhere the 4 petals together using normal PVA glue and then inset the stem in the middle. Hope it helps! Dear manuk. Please teach me how do you make this stamens. your creations are gorgeous. Thank you very muh. no words to express. absolutely gorgeous. outstanding. fantastic. superb. hats off. I have started to quill recently and as you say it is really additive. but your work. my god it is just beyond imagination.